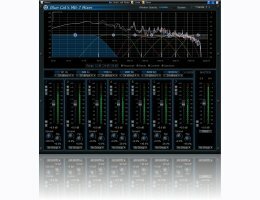 Blue Cat's MB-7 Mixer is a unique plug-in that splits the signal into several frequency bands and let you mix them as if they were separate tracks. Each band proposes controls that you can find on a mixing console, and more: bypass, mute or solo each band separately to isolate frequencies you want to work on, adjust the gain, the "stereoness" and the position in the stereo field. When manipulating the stereo image, a master mono switch also lets you check mono compatibility. The plug-in also proposes unique linking and grouping options thanks to our multi-instances technology. You can link bands together within a single instance or between several instances of the plug-in on different tracks. This lets a simple fader control as many bands on as many tracks as you want. This is particularly useful when adjusting the placement or the balance of several competing tracks. And as usual with Blue Cat Audio, the plug-in provides comprehensive visual feedback to let you know what's exactly going on: for each channel, monitor the spectrum, the in/out levels and the frequency response. Thanks to its advanced MIDI and automation input capabilities, when combined with our other plug-ins, Blue Cat's MB-7 Mixer is capable of advanced side-chaining features that really unveils its potential. Multiband mixing console: adjust the levels, panning and "stereoness" of each band separately. Multiband VST Host: insert third party VST plug-ins and process each band independently. Pre and post fader VST plug-in inserts, with full latency compensation. Up to 7 bands, with crossover filters from 6 to 96 dB/Oct for optimal separation. Multiple instances linking: group bands within a single instance or between multiple instances of the plug-in. Modify the spectrum on multiple tracks with a single slider. Bypass, mute, solo on every band. Mono switch on master for mono compatibility check. Dual Mode: independent left and right or mid and side channels control. Complete visual feedback with real time response curves, spectrogram, and levels display for each band. Fully customizable modular user interface, with multiple sizes. Supported platforms: Mac-AAX,Mac-AU, Mac-RTAS, Mac-VST, Win AAX, Win-DX, Win-RTAS, Win-VST, Win x64-DX, Win x64-VST.